Well, a lot has happened since our last update, we have been posting regular as they happen photos etc on facebook. Work is now progressing well, when daylight saving come around it shall make a big differnace to how much we can get done. So roll on....we are still optimistic that we shall finish by the end of the year. 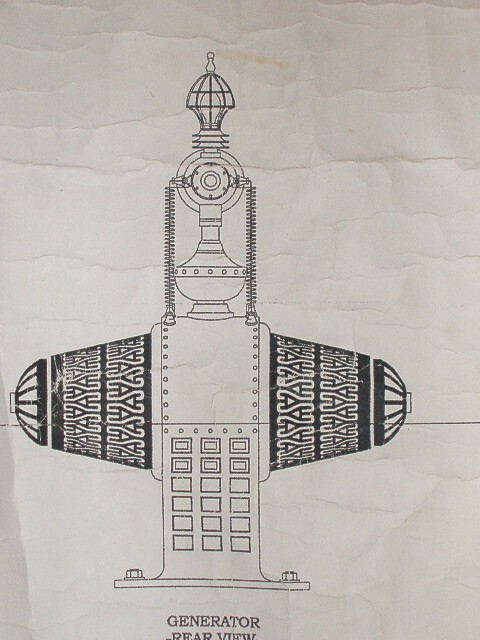 We shall keep you informed of the upcoming exhibit, the replica prop of the Time Machine from the 1960 movie of the same name. Work is slowly progressing, we hope to have it completed by the end of the year. Currently working on template for light cage the pawn like thing at top and the holders for wire and finding off the shelf items for large bolts and rivets to go around the housings and the stencils for painting the pods etc. Tedious work!!! Here is the engine section partially gelcoated. Gellcoat is a thin paint on white plastic. Some parts are made out of MDF these parts need to be coated to give a more uniform finish. Pllus seal the surface, when painted, especially with metal colours this will give the appearance of real metal. Without the coating, it will appear lifeless and flat.The engione pods themselves have been causing problems, I have now solved these problems by discovering that I am better off using the better of the two and moulding it and recasting two new pods. Plus if I gelcoat before fibreglassing I can see still see light shining through. Which is essessional for this part as these are lighted. This has been the main reason for delays, devising a way of making them see through. Normally any imperfections would be filled with bog or thick resin. Such is the learnin process....much like Thomas Edison's experiments with the electric light, it took him 800 goes to perfect the filament in the bulb. Doing things 2-3 times seems nothing by comparison. The holes are called lug holes, when filling with plaster they created male parts for the female parts to fit into when the reverse side is completed. When joined together they can be lined up perfectly to make the cast.As this part is where the motor is going to drive the dish it needs to be hollow. A thick edge needs to be around the edge for when the two halfs get glued together after the electronics are completed. 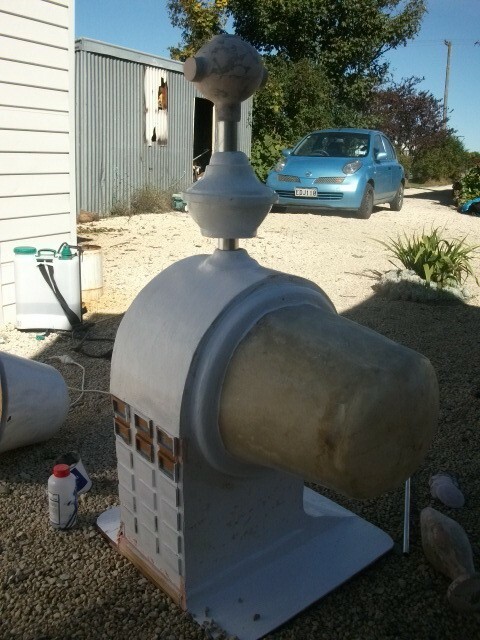 The cast will be in fibreglass for weight and practical reasons. 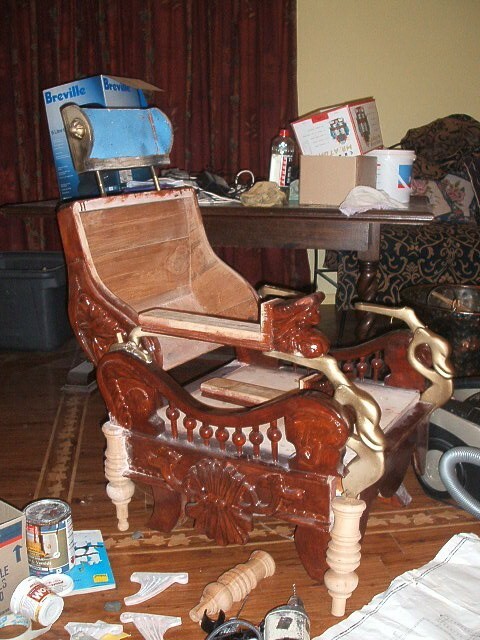 The Time MAchine chair is constructed from 200 separate pieces of wood and casted resin parts. 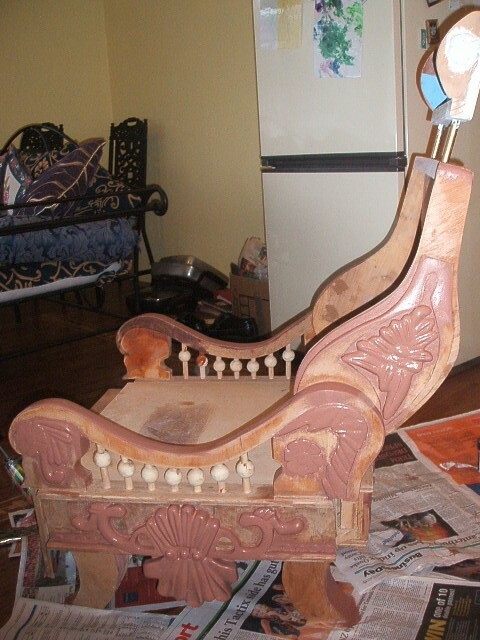 Here is a shot before the painting and staining is done, over the next few shots, you will see it transformed. All materials looking the same, such is the magic of movie prop making. 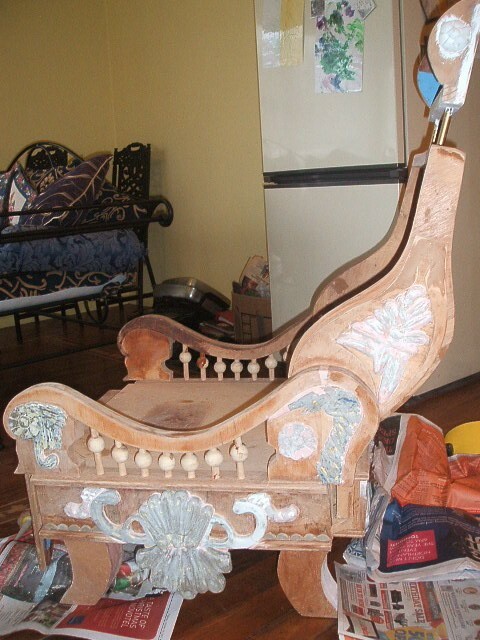 Orignally, the chair was altered from a 1901 barbers chair, but here we have to recreate all the fancy carving etc.Three months solid work...by the time the whole machine is finished, some 2000 hours would have been spent constructing it. This faux painting, making differnt materials appear to look like something else. 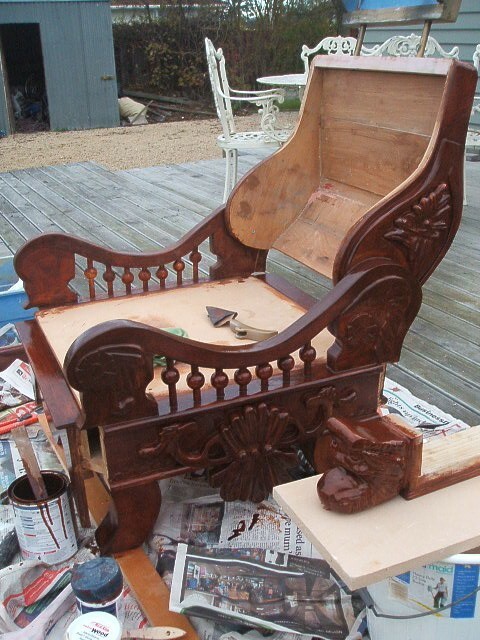 Resin is painted with a light brown colour, then a darker colour, and then stained to match with wood. It blends in to appear the same, the results are stunning. First time I've ever tried this process, and I'm impressed.